For many people the beginning of everything is a very big mystery. Some think there was just emptiness or a void or that there was darkness and only Chaos. According to Greek mythology, the origin of everything, and the first thing that ever existed was Chaos. It was the primordial void, the source out of which everything was created, including the universe and the gods. For many there were gods who took care of everything coming into being. Also lots of Christians do believe that there were gods who created everything together. The biggest mistake those so called Christians make, is that they believe that there was a God the Father, a god the son and a God the Spirit who together created the universe and everything around. They do not understand that The Creator is, was and always shall be the Most High Being and as such has not only the title of god, like any high being, but also speaks in the plural form with the Pluralis Majestatis or Royal We. Speakers employing the “royal we” use it to distinguish their private life with their function, or when they are directors, editors, writers, etc., they use it to avoid the personal I or to represent a collective viewpoint. A person in function, like the Creator, the Maker and makers of things, creators of pieces (artists, theatre and film directors, choreographers, etc. ), directors (bosses or managers of institutions, universities, schools, factories, industrial or technological sites), leaders of a Courtney or group (kings, queens, presidents, führers, popes, cardinals, priests, pastors, youth-leaders, club-leaders, cheerleaders) will use the plural form when they speak as creator, artist, director or in function. 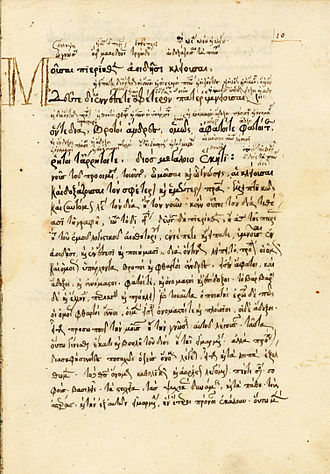 16th century manuscript of Theogeny: “the genealogy or birth of the gods” poem by Hesiod (8th – 7th century BC) describing the origins and genealogies of the Greek gods, composed circa 700 B.C. It is written in the Epic dialect of Homeric Greek. We may find people who believe in mythology where out of the void appeared Erebus, or an other god as the personification of the deep darkness and shadows and brother of Gaea (earth), Tartarus (underworld) a god, third in rank after Chaos and Gaea, preceding Eros (love), and Nyx (night). There are a various amount of viewpoints on creation, but we want to stick to the one which is told by the Divine Creator Himself. We, as Christians do believe in an eternal Creator divinity, and as such in a spiritual Supreme Being or eternal Spirit God, which had no beginning, has no birth and no ending, cannot die. That Supreme Being out of the darkness created “Light“. You might call it “Big Bang” or the “Supreme Light”, that does not matter so much, but important is that you can find yourself in accepting that from nothing something came into being and there came light. All those who say that this or that was there or that the Big Bang was the first thing, should wonder how and out of what this big bang came into being. For sure they would say that “Before” the Big Bang there was Blackness, nothingness, something, void and should wonder what was the next thing “after” the Big Bang. 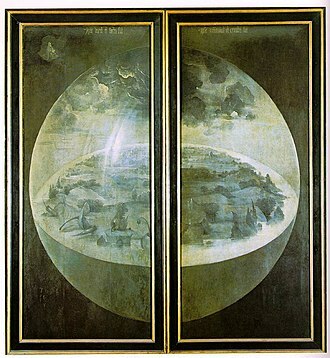 In the knowledge that “one day” for God is in the eyes of man a “thousand years” we can think of it that there have been a long period over this coming into being from one element into the next one, because on the second day of God sky or celestial dome was created. It was or is what we do know as the wideness which includes the atmosphere and outer space. All people in the world should come to know the Name of God. He does find it important that His creatures should know Him by His Name and know that He only is the Most High ever. 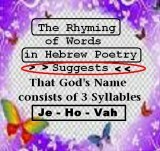 Probably shall find no other people called the same because God the Divine Creator said He is the only One with that Name, which may not be taken in vain. Later He reminded Moses of His great name and that He is the covenant-making and covenant-keeping God, who will absolutely fulfil His promises (Exodus 6:2-5). The name denotes not Who is the eternal existence and that unchangeable truth and omnipotent Power which give fulfilment to His promises. It were as though He said, “I am Jehovah, for I am now to do what I have declared to be My purpose.” Compare, for further illustration of this name, Exodus 7:5 and Ezekiel 28:22. It was not at the creation that The Divine Creator would let His Divine name be known, but that does not mean it was not important not Him bringing everything to existence. The world came to know Who had created everything and all people should be fully aware of that. Already in the first book of Mozes (the Bereshith, the book of the Beginnings or Genesis) we are told that it where no gods but God alone Who created man in His image and how heaven and earth were created. My only guess is that this statue is of the Greek God “Adonis” – Aphrodite’s lover, and the god of beauty and desire. Or perhaps, but not likely, the Greek Hero, Hyakinthos – Apollo’s lover who died by a discus. A new series about the life of mortals living among the many gods and monsters of Olympus is on its way to SyFy channel. The 13-episode mythology action drama began filming in August of 2014 in Vancouver. No specific release date has been set so far, but it’s slated to air in the spring of 2015.According to the Hollywood Reporter, the synopsis for the series centers on how a handful of brave men and women banished the gods to the realm of the Underworld, otherwise known as the Kingdom of Hades. At the dawn of time, or perhaps, simply a beginning, since there were no sun to determine a “dawn” yet, there were 6 deities.These deities crafted a world over which to reside, and declared themselves to each be rulers of their own regions, that the others would not interfere in the others’ places.The three Gods of Domain were Althax, Lord of the Sky, Enthros, Lord of the Sea, and Darus, Lord of the Earth.The three Goddesses of Dominion were Enya, Lady of Creation, Ori, Lady of Destruction, and Juno, Lady of Balance. The Phoenix was a bird from Greek mythology that was known for being reborn as it arose from the flames of its predecessor.